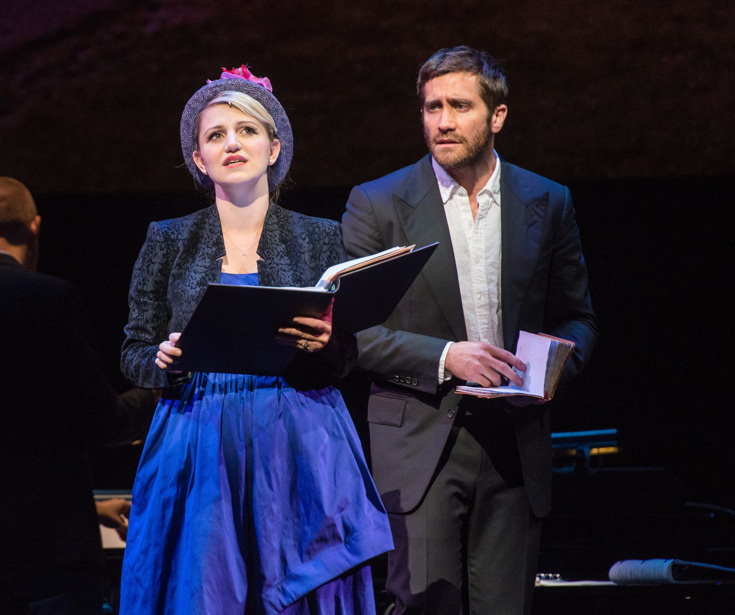 Annaleigh Ashford & Jake Gylenhaal in "Sunday in the Park with George"
The stars and producers of this season’s musicals can breathe a sigh of relief: there’s one less horse in the 2017 Tony Awards race. Producers of the revival of Sunday in the Park with George, which starts performances at the renovated Hudson Theatre on February 11, have announced their decision to withdraw the show from consideration for this year’s prizes. A statement reads: "The producers of Sunday in the Park with George will not be submitting Hudson Theatre’s engagement of this New York City Center production for awards eligibility. With a season so full of tremendous, soon-to-be long-running new musicals and revivals, the producers feel this extremely limited, special run of Sunday stands most appropriately outside of any awards competition. The production is nevertheless proud to be part of such a landmark Broadway season." In a crowded season of musicals, Sunday would have found itself up against productions of Cats, Falsettos, Sunset Boulevard, Miss Saigon and Hello, Dolly! for one of nominee slots in the Best Revival of a Musical category. Even more competitive will be the 2017 acting categories. Hollywood star Jake Gyllenhaal, who received rave reviews for his performance as George in the production when it premiered at City Center last year, would have been a major contender in the Best Leading Actor in a Musical race, which could also includes turns by Jon Jon Briones (Miss Saigon), Corey Cott (Bandstand), Josh Groban (Natasha, Pierre and the Great Comet of 1812), Andy Karl (Groundhog Day), Derek Klena (Anastasia), David Hyde Pierce (Hello, Dolly! ), Bryce Pinkham (Holiday Inn), Ben Platt (Dear Evan Hansen), Bobby Conte Thornton (A Bronx Tale), Michael Xavier (Sunset Boulevard) and two-time winner Christian Borle, who should prove eligible twice for Falsettos and Charlie and the Chocolate Factory. In the leading actress category, past winner Ashford will avoid a Tony night showdown opposite stars like Christy Altomare (Anastasia), Denee Benton (Natasha, Pierre and the Great Comet of 1812, Christine Ebersole (War Paint), Lora Lee Gayer (Holiday Inn), Patti LuPone (War Paint), Eva Noblezada (Miss Saigon), Laura Osnes (Bandstand), Phillipa Soo (Amelie) and, of course, Bette Midler, who is returning to Broadway musicals after a 50-year absence to play Mrs. Dolly Gallagher Levi in Hello, Dolly!. Stars Mandy Patinkin and Bernadette Peters both received Tony nominations for their work in the original 1984 Broadway production of the Stephen Sondheim/James Lapine classic. A 2008 Roundabout Theatre Company revival also earned nominations for British leads Daniel Evans and Jenna Russell. Nominations for the 2017 Tony Awards will be announced on May 2. The 71st Annual Tony Awards will take place on June 11 at Radio City Music Hall.